Americans Unwittingly Elect Terrorists to Congress? I truly believe that Politicians and any other people responsible for placing America’s finances into such chaos as to make us vulnerable to strong arming by foreign Governments, and specifically Red China are Terrorists. America is deep in debt to China and that has empowered the Chinese to push us and test us. Internet attacks, conflicts in Trade, The current debacle in the S. China Seas – And there is nothing we can do to fight back as WE OWE them TRILLIONS of $. The folks who put us in that position, all who are still living, need to be rounded up and convicted for their financial crimes against America – I suppose that’s just one mans opinion. But it’s my story, and I am sticking to it! In the coming years, it will be harder and harder for Americans to remain indifferent to Islamic terrorism, because so much of it will be close to home disrupting our daily lives and dividing the nation along a deep ideological fault line. We’ve already seen the split that followed in the aftermath of the Texas cartoon contest – as many condemned Pamela Geller as praised her. That’s only a sample of things to come. As terrorist attacks in our nation become more frequent and more deadly, American thinking will become more sharply divided, pitting one side blaming the victims for being “provocative” against the other side blaming the Islamists for being terrorists. Depending on which worldview prevails, an oppressive atmosphere could settle over the USA – and for all and intents and purposes that would mean the terrorists have won a decisive battle in their Jihad to destroy our society and way of life. The wild card in all this is the outcome of the 2016 election. It is probably our best (and last) hope. Americans are not quick studies and are easily distracted. 9/11 was a warning most of us have already forgotten. If we don’t elect a president who loves our Constitution, shares our values, and is willing to do the hard work to reverse Obama’s damage, we will suffer a slow death like the frog in the kettle. What happens after that is anyone’s guess. “I think it’s fair to say, without commenting on the particular country of origin, there are monies coming into this country which are advocating this kind of [Islamist extremist] approach to life,” Richard Fadden said Monday during a national security hearing concerning a new counter-terrorism bill. He also described the obstacles to tracking how the money is spent because of Canada’s respect for religious freedom. “The difficulty is in most cases the monies are not coming from governments; they’re coming from fairly wealthy institutions or individuals within some of these countries. It makes it doubly difficult to track,” Fadden said. It is “quite difficult” to determine where they money ends up. Last year, the Royal Canadian Mounted Police (RCMP) raided the offices of the International Relief Fund for the Afflicted and Needy (IRFAN-Canada) after federal auditors accused the Muslim charity for transferring $15 million to Hamas. The Canadian government subsequently added IRFAN-Canada to its list of banned terrorist organizations. IRFAN-Canada lost its charity status in 2011 following a Canada Revenue Agency (CRA) audit that exposed the organization as an “integral part” in Hamas’ international fundraising infrastructure. A 2004 report by the Council on Foreign Relations revealed that Saudi Arabia is promoting its brand of radical Islamist ideology in Canada by funding certain Islamic institutions. The Saudi government acknowledged that it funds Muslim institutions in Canada, including mosques in Ottawa and Calgary and an Islamic center in Quebec. The task force said that Saudi Arabia spent hundreds of millions of dollars to finance 1,359 mosques and 210 Islamic centers around the world. “This massive spending is helping to create the next generation of terrorists and therefore constitutes a paramount strategic threat to the United States … This massive spending is an integral part of the terrorist financing problem. It fosters virulence and intolerance directly at the United States, Christians, Jews and even other Muslims,” the report said. Israeli defense company Elbit Systems develops sensor-based detection system to be implemented alongside entirety of Gaza border. A new tunnel detection system developed by Elbit Systems will protect Israeli citizens from the threat of infiltration by Hamas terrorists. Now, after two months of development, the Israel-based international defense electronics company says that they have created an effective system which uses sensors to detect tunnel building activity. The system will be implemented along the entire Israel-Gaza border, Elbit said. 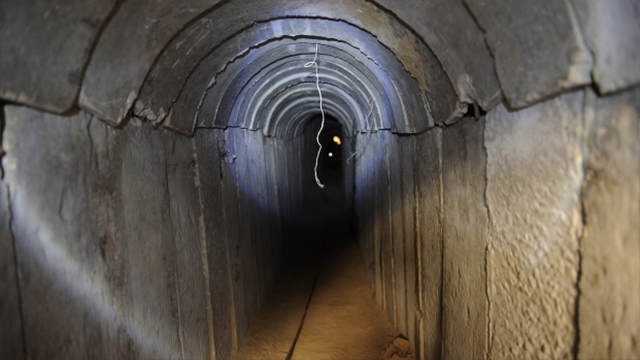 Picture of tunnel featured in Hamas newspaper during Operation Protective Edge. The system includes a series of sensors. The information they receive is analyzed using a control system based on algorithms. This method enables the precise identification of tunnel building and its location without false alarms. The system is the first of its kind in the world and was developed in Israel in record time by the Director of Research and Development in the Defense Ministry in cooperation with Israeli industries. Similar to the Iron Dome system developed by Rafael Advanced Security and Israel Aerospace Industries, the new tunnel-detecting system was developed as a response to a direct threat from Hamas – tunnels constructed from Gaza to Israeli territory, which were exposed during Operation Protective Edge. The system has already been implemented on parts of the border but its wider implementation along the entire Gaza Strip will require approval by the security apparatus and an assigned budget. Security officials updated regional council heads on the Gaza border on the technological advancement reached in the search for a solution to threats coming from Gaza. Alon Shuster, head of the Sha’ar HaNegev Regional Council, said he has been closely following the massive efforts made by the Defense Ministry and the IDF in developing measures to locate tunnels. “From what we know, these are the fruits of that labor. There is no doubt that the aggressive operations this past summer limited the threat in a significant way for Israel and this advancement gives an additional layer of security for the residents,” he said. via Secretary of State John Kerry demonstrates why Huma Abedin’s background mattered | Walid Shoebat.